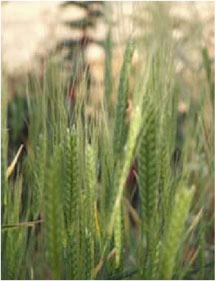 Although slightly lower yielding than modern uniform wheats, ancient wheats are taller with greater photosynthetic activity and have larger root systems that better absorb the organic nutrients that give higher nutrition and impart rich flavor. 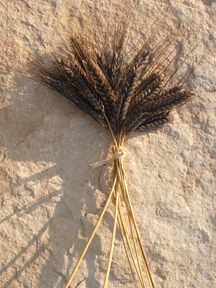 Ancient wheats are more adaptable to unprecedented climate change and are incredibly delicious! 6. Does einkorn make a thin, extensible dough-window? 7. How will it rise? We made thin flatbreads, 3/4 inch thick breads and used loaf pans. 10, Is it ready yet? 11. Ahh the fragrant aroma! 12. Delicious ancient wheat breads are a success! Next steps: We'll keep careful notes about time, temp, and proportions and will try different methods, using a "control" of each recipe with AC Barrie for valuable info on how the different flours absorb water, and to compare extensibility and elasticity of each. The Tukenbrod goal is to eventually produce both a good flatbread that puffs up nicely, and a loaf that rises on a par with modern whole wheat bread (made like Trukenbrod anyway, not like the drier, store-bought version of ww bread.) J.M.